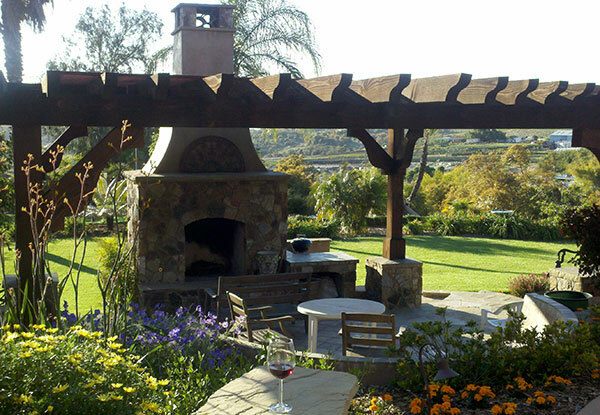 Daniels Landscape built this custom pergola to provide shade over this outdoor fireplace in Bonsall, CA. We excel at the design and installation of custom outdoor kitchens. 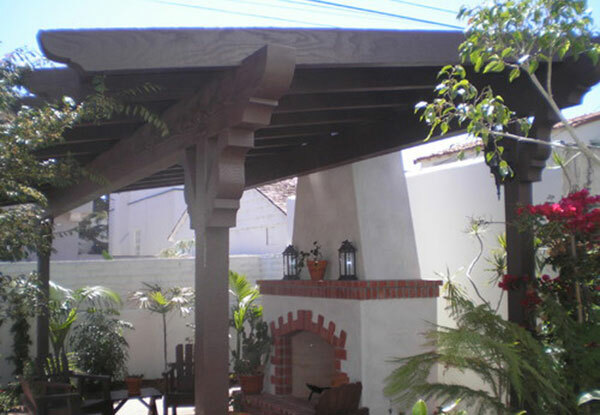 We built this custom pergola for an Escondido resident. 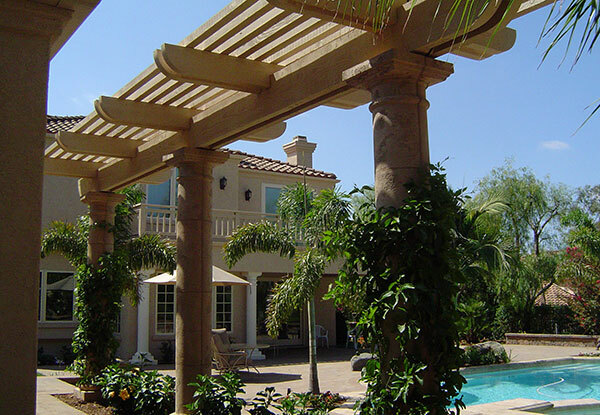 This quaint pergola is held up by round columns and creates an excellent accent structure to this beautiful backyard. 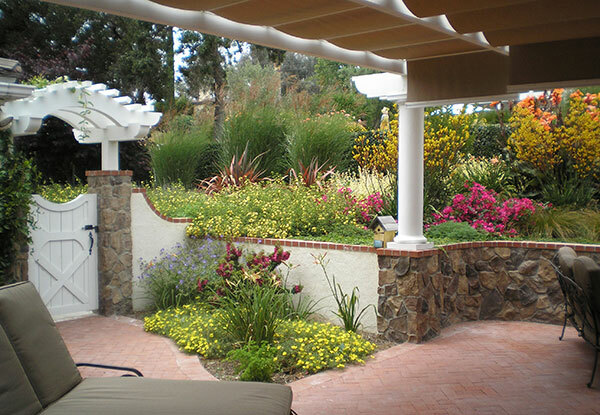 This beautiful arbor in La Jolla, CA was designed and built by the landscaping experts at Daniels Landscape. 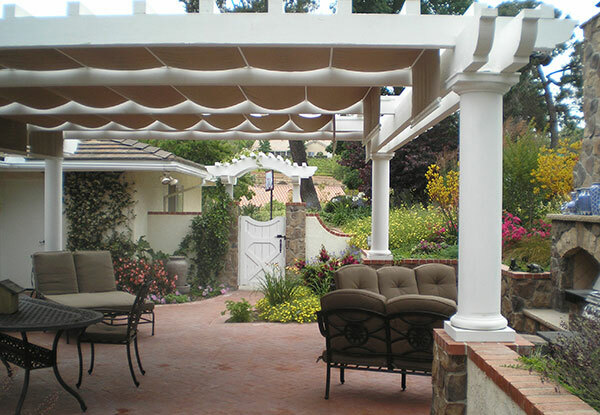 The arbor features a dark brown lattice top held up by two round support columns. 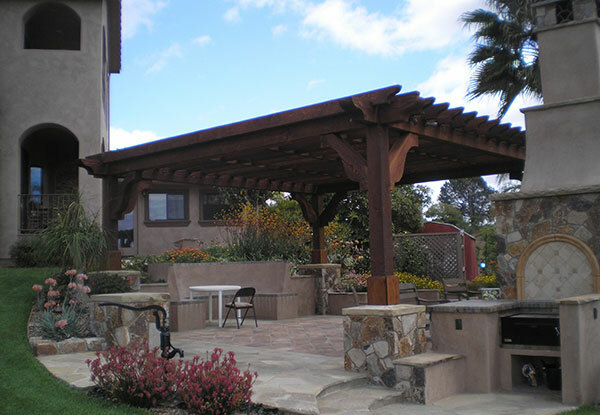 We designed and installed this pergola in Escondido, CA as part of an entire backyard remodeling project. The pergola is an excellent accent piece between the swimming pool and the home’s outdoor exercise room. 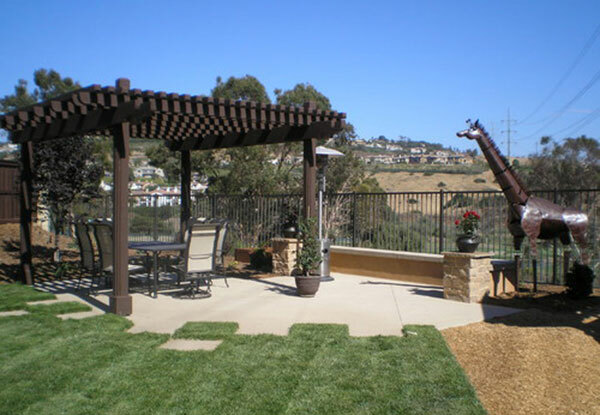 After laying the concrete patio for this Carlsbad residence, Daniels Landscape built this large pergola to create shade for this outdoor entertaining area. 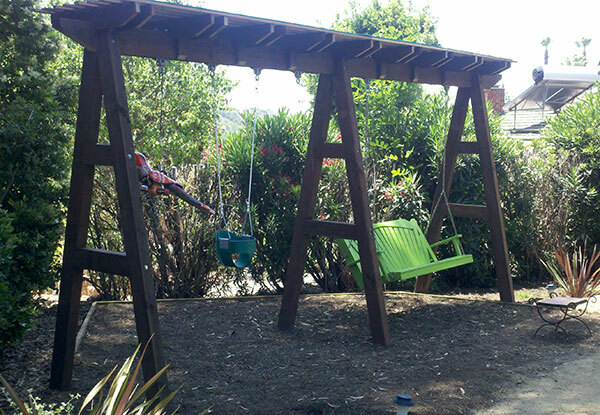 We designed and built this custom wooden swing set in Vista, CA. The swing set provides a place for our client’s grandkids to play while complementing the style of their home and outdoor space. 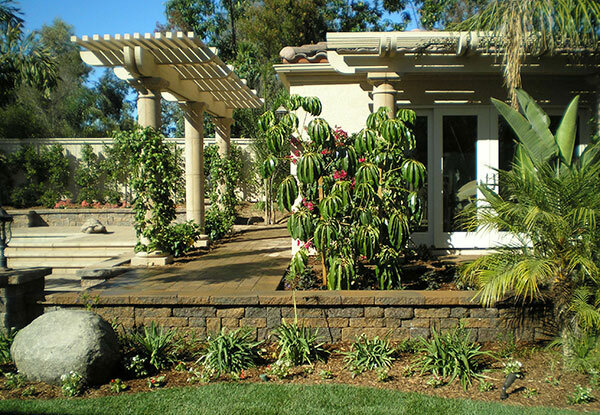 This custom arbor in Escondido, CA features three concrete support columns that are wrapped with vines and surrounded by small plants. 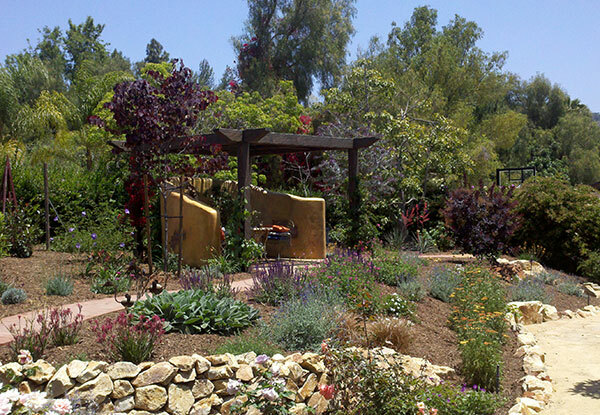 Daniels Landscape did a complete backyard renovation for this San Marcos property. We laid the concrete patio, built the wooden patio cover, and installed a lattice fence around the air conditioning unit. 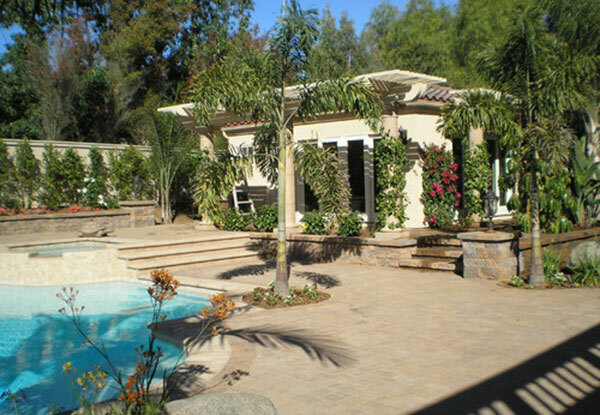 This patio in Kensington, CA was custom designed using cantera pavers, pacific clay brick, and hand painted masonry to complement the character of this 1920’s property. 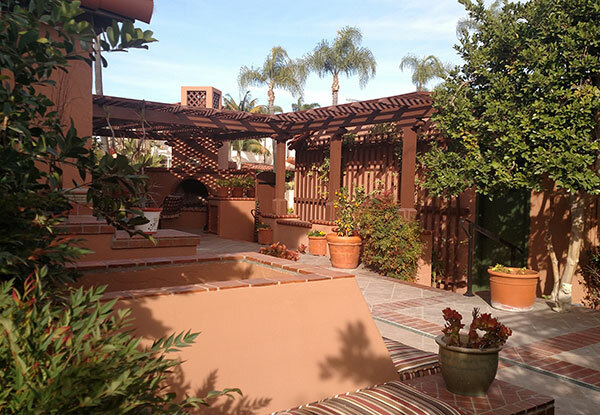 This gorgeous patio in Kensington, CA features a hard-fired brick clay fireplace, hand-painted masonry, and a lattice patio cover to create the perfect outdoor entertaining area. This massive wooden patio cover in Bonsall, CA was designed and built by Daniels Landscape to provide shade over this outdoor kitchen. Daniels Landscape built this beautiful outdoor stone fireplace for a Vista residence. The outdoor space was completed with a large patio cover to provide a nice shaded space. 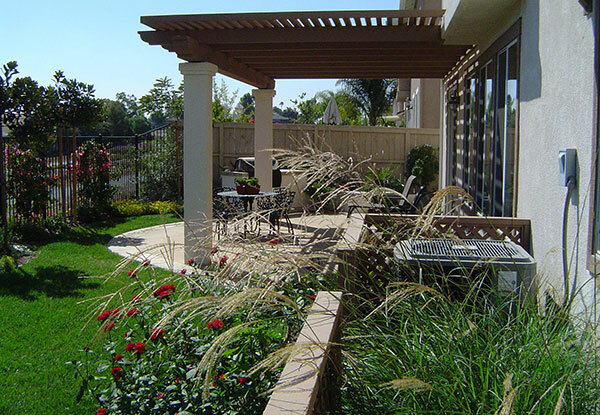 This patio cover in Vista, CA was designed and installed by Daniels Landscape. The cover is supported by round columns and features manual roll shades that can be moved to control sun exposure. 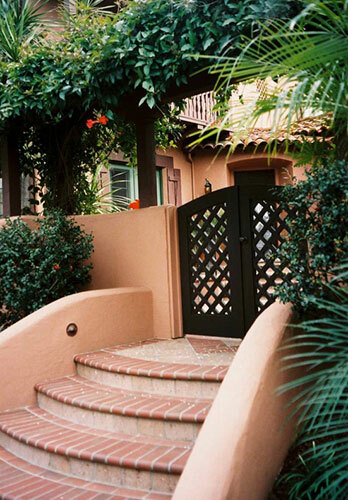 We custom built this side entry gate with an arched arbor in Vista, CA. Our client showed us a picture from a magazine and we brought her vision to life. 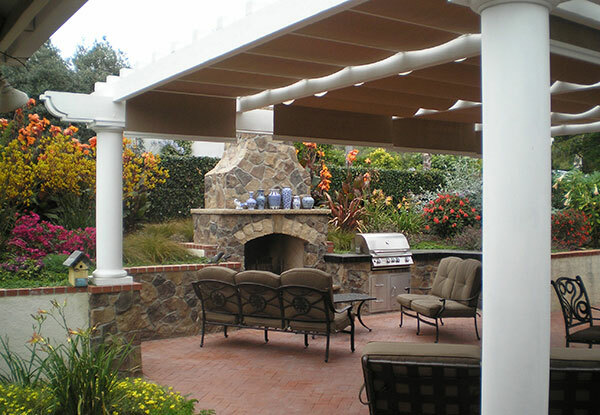 This patio cover installation in Point Loma, CA was the finishing touch to this landscape remodeling project. 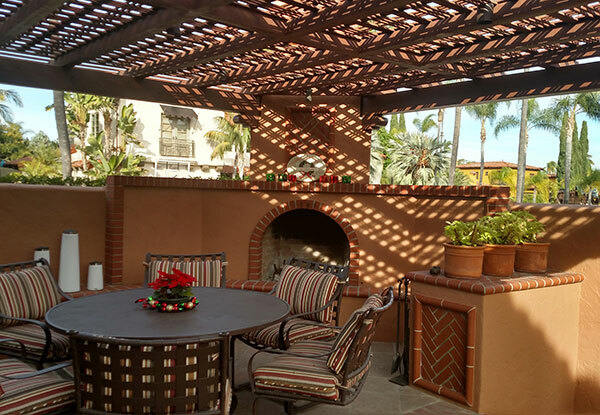 The lattice wood patio cover provides a shaded area over this spanish-style outdoor fireplace. 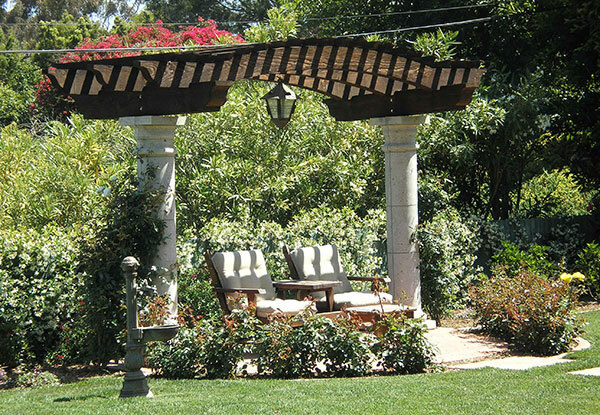 Daniels Landscape built this wooden pergola for a Vista, CA residence. This pergola provides shade over the peaceful meditation garden that was custom built for a client who wanted a special place to relax in her backyard. This wooden arbor was installed in the front yard of this Vista, CA home as part of a complete landscaping design and construction project. At night the LED lights perfectly illuminate the path beneath the arbor leading to home’s front entrance. We designed and installed these steps with an arched arbor for the entryway of this Kensington property. The entry to this residential courtyard was specifically designed to match the home’s 1920’s character.